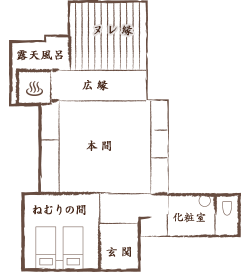 Main building "Hooh-den" and "Kujaku-den"" are prepared with 5 types of rooms featuring sumptuousness and warmth. 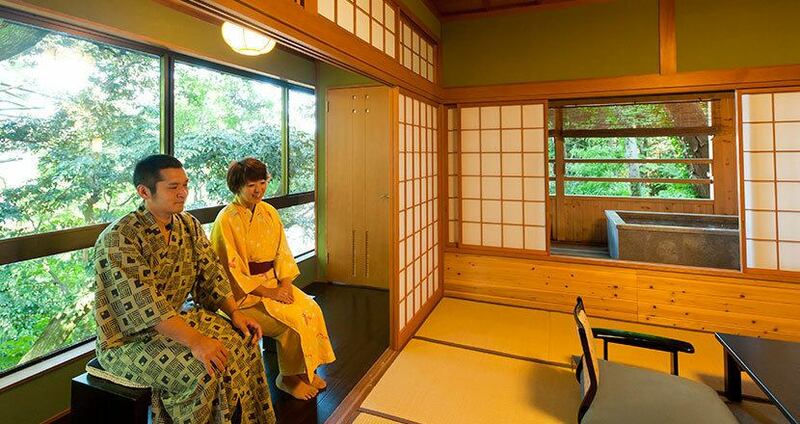 Please relax in the room that cherishes the restless Japanese space of Japanese inn. 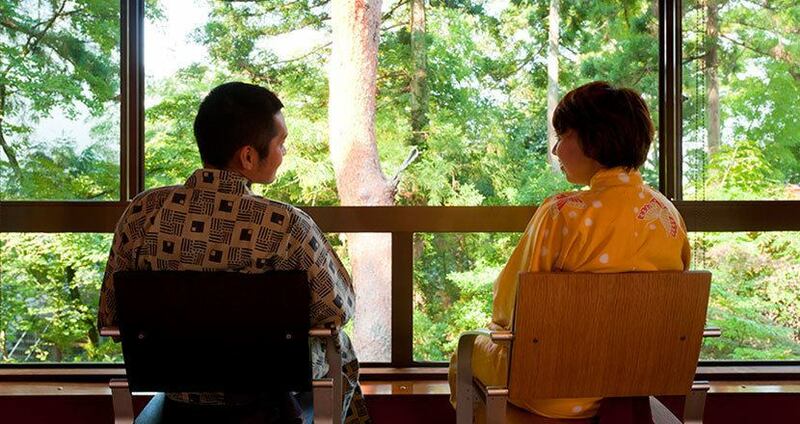 In addition, a place where you can return to yourself naturally and with its source "Shofuan" is a room Guest Room with Hot Springs Open Air Bath 5 Guest Room with Hot Springs Open Air Bath. Fun of Hokuriku that expresses expressive nature and season, please enjoy yourself at ease. 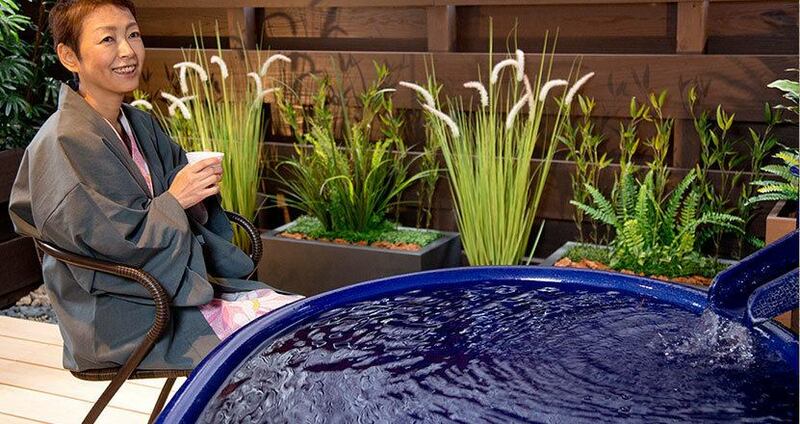 Room of renewal in October 2014 which consists of 18 square meters pure Japanese style Honma and hot spring outdoor bath. Homma has Italian furniture of the owner's passion also arranged. If you can spend your time in a colorful and compact room, your relationship will be further deepened. It is a room with a hot spring open-air bath with a vivid color theme like a peacock feather. There are two types of "red" and "ultramarine". 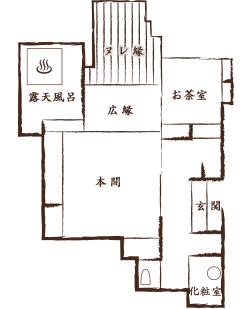 In the comfortable Homma of sumo shop wrapping Japanese, we have a "Nemuri no Ma room" produced by a Nemuri no Ma coordinator as a Second Room to pursue true peace. Shoroku no Ma the Shokei no Ma Nemuri no Ma, we are somewhat wider than the space Shoroku no Ma the Shokei no Ma the Nemuri no Ma. Experience the healing sleep enveloped by the warm light that the light of popular designer produces. 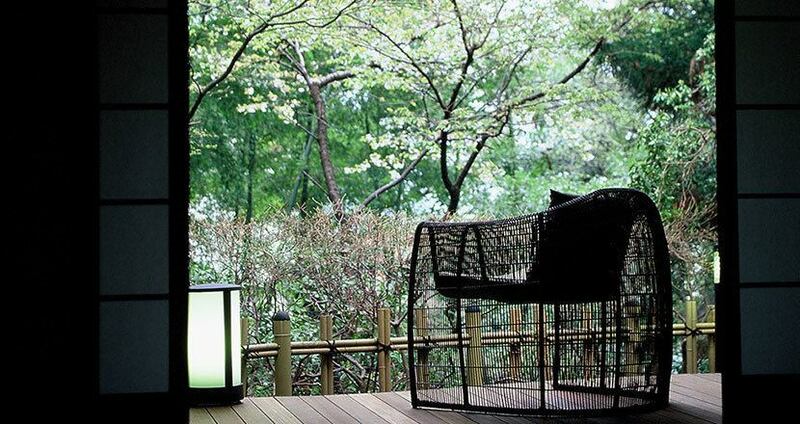 A spacious outdoor bath that even a double name can be included.In front of you there is a garden yard where lanterns etc are arranged, you can enjoy the atmosphere of Japanese. This open-air bath is a very unusual source sinking as an outdoor bath in the room. Please enjoy the moment of bliss, watching the garden. A peaceful space with a fresh outdoor bath and "Nemuri no Ma"
·We are preparing floor heating for Honma so that we can spend comfortably in winter. Special room with restaurant (dining) with popular furniture designer Mr. Eiri Iwakura arranged in the traditional building · vermilion room of Kaga Region that was used to hospitality especially chosen from the time of Kaga Clan is. For dining, we are considering to relax and have a relaxing meal time such as a light emitting a gentle light, a passion Ryukyu Tatami arranged at your feet, a dining set devised so as not to get tired even if you sit for a long time . 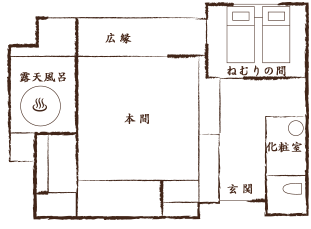 Please sit in the furniture with the theme "Simple is best" and enjoy the taste of the season of Hokuriku. You can leave yourself in a rounded edged bathtub and watch the surrounding trees you can taste a mysterious atmosphere like bathing in a spring in the forest. ·Please relax in the space of healing and refreshing Jyunnama no Yu who used the only source amount of Yamashiro Onsen. ·We prepare a kotatsu in Honma so that we can spend comfortably in winter. 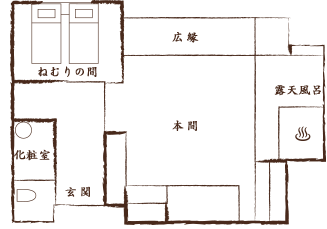 ·Please note that for disabled people, we will climb the stairs to the room. The authentic 8-square meter tea room and the garden spreading in front of the rim make you feel the taste of Japanese wine. In the tea room you will not only enjoy the green tea after you arrive, we will have breakfast the next morning. Please spend a refreshing moment while the morning sun is plugged in. From the spacious outdoor bath with a source sprinkling, there are a lot of pine trees old that became the origin of the name "Shofuan", autumn leaves which change fresh green, autumn leaves, snow scenery and coloring, seasonal trends of the Hokuriku region You can enjoy the grading. In the wide edge that protrudes to the garden, how about a snapshopper while taking a light of the gentle sunshine? The bamboo grove that enters from the wide edge directs a quiet time away from the hustle and bustle. In the daytime, shining sunlight illuminates bright vivid green, while in the evening bamboo forest is illuminated by sunset and you can see the calm natural beauty. Shorai no Ma is a room with "Nemuri no Ma" as well as Shokei no Ma as well as Shokei no Ma. You can enjoy the scenery of relaxation that wants nature from the windows imitated as the most round shape.Comfortable darkness invites comfortable sleep. A somewhat smaller hexagonal outdoor bath nestling in the sunlight and a gentle breeze are plugged in. Enjoy watching yourself in source water, basking in the birds while listening to the birds singing and the sound of insects. From the open-air bath, you can also enjoy the trees that cover the surroundings and the night view of the spa town in the evening. Please enjoy various scenery such as day, evening, night, morning. 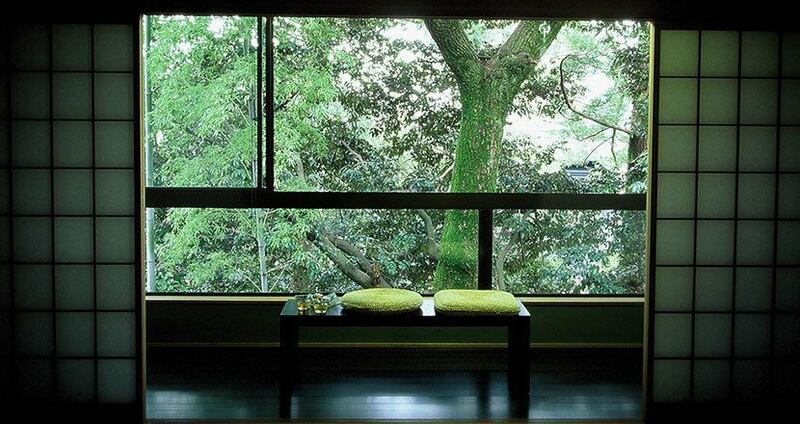 Sit on a wide edge bench and watch the other side of the window, you can see a forest where big old trees rise. We are considering to feel "healing" as the whole space such as Diatom Earth wall. 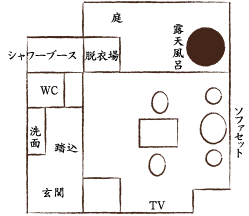 Both Homma and Nemuri no Ma are non-smoking rooms. The other rooms are 7 rooms with outdoor baths, large rooms, special rooms and so on. 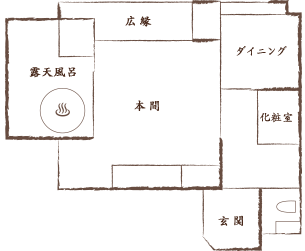 Wi-Fi connection is available in all rooms, but some rooms may have weak radio waves. 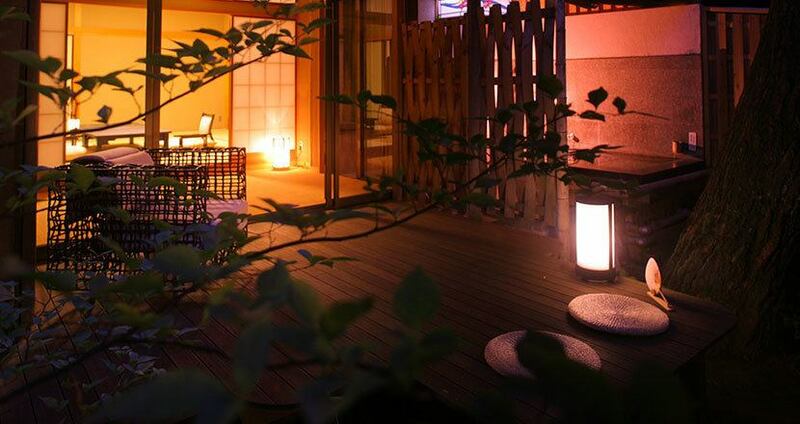 There is service such as hot water wash toilet, duvet, pajamas service, broadband connection (personal computer required) and non-smoking rooms (first come first served) to Guest Room with a Private Open-Air Bath directly from the source "Shofuan". Guests accompanied with pets can arrange for pet hotels (inquiries in advance).